In attempting to clean out storage areas two months ago I came across bundles of sweet grass dating back to the early eighties. Back then at the Michigan basket conferences some Native Americans from Maine would arrive selling their sweet grass. The smell of this was simply divine. 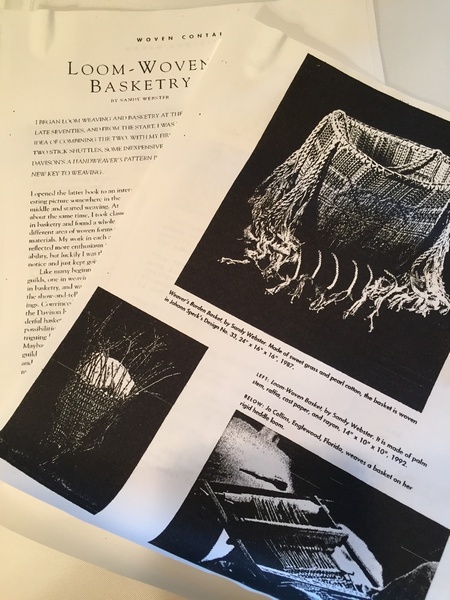 I used mine very sparingly on small coiled baskets or inserted into inner and outer rims on splint baskets….especially those having to do with sewing. 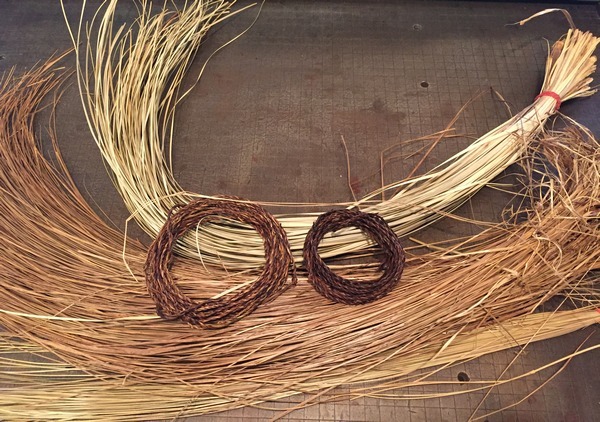 In the above picture are two coils of my attempting to ply the sweet grass into cordage. Both thumbs protested after about one hour in the tight gripping and twisting action necessary to hold a good ply. I used the shorter of the sweet grasses that I harvested myself in Michigan or out in Washington state many years ago. I found another bag full of this shorter one tucked into the studio near some shed snake skins. What in the world am I going to do with those! 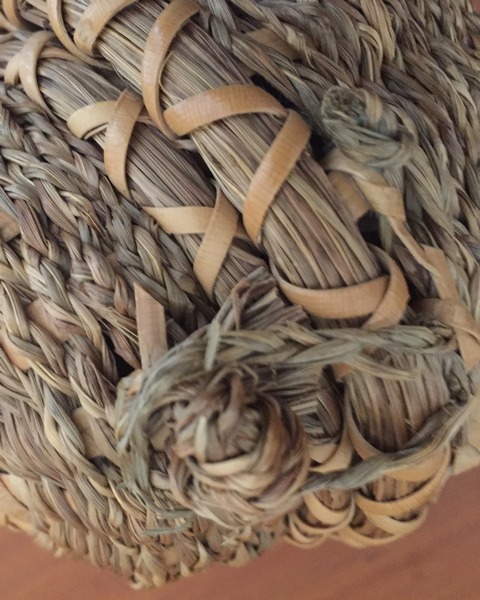 Anyway, Here is one of the small sweet grass baskets I made from looking at a Native American sewing accessory. The ring fits over the wrist so that the “ball” that holds the yard is not dropped. The thread to be used is kept inside the ball that is latched shut. The thread feeds out the small hole in the upper part of the ball. 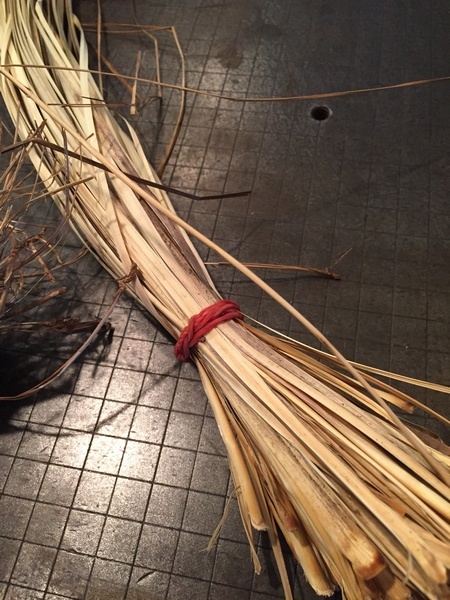 I had braided the sweet grass to use as the weaving element over cane spokes. The rims are lashed with cane as well. I think cane must have been the only small pliable material I had back then. 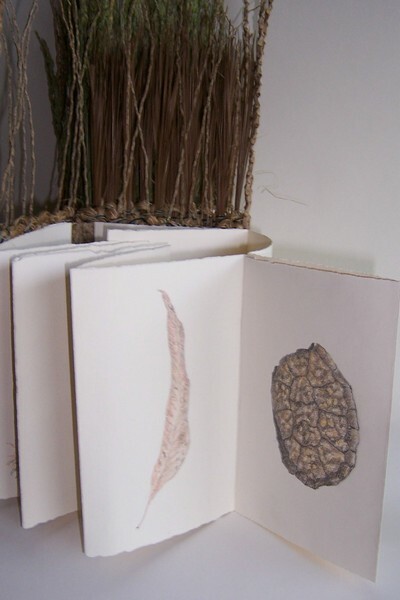 Native Americans used ash splints for their spokes/lashing. 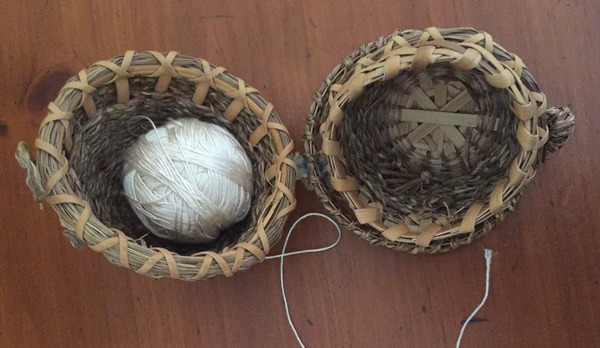 A loop of braided sweet grass came off of the rim from one half of the ball and looped over a knot of sweet grass on the other half to keep the sewing ball closed. I thought this was a rather ingenious way of keeping small balls of threads/yarns close to what you were crocheting/knitting/wrapping. I made only one….who would ever need more? 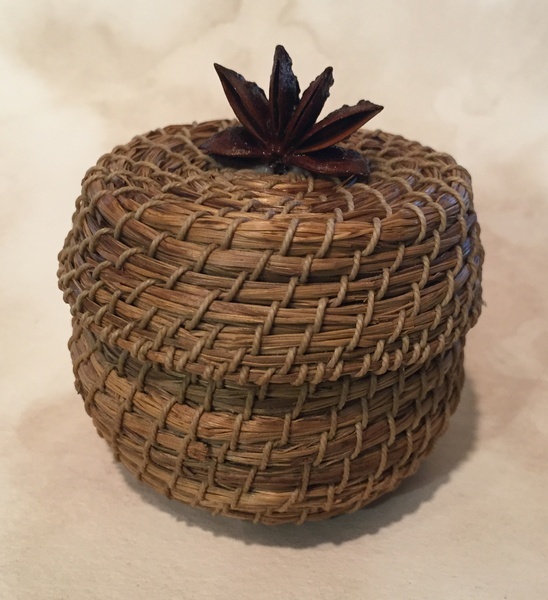 Here is another small basket I wove with the sweet grass. You can tell it is small by the anise pod on top for a handle. It is a wonky little thing but I am sure that at the time I was more than a little pleased that I could make a lid that fit over the top. So it is the eighties remember, hay day of craft experimentation. Here is what good coiling is supposed to look like. 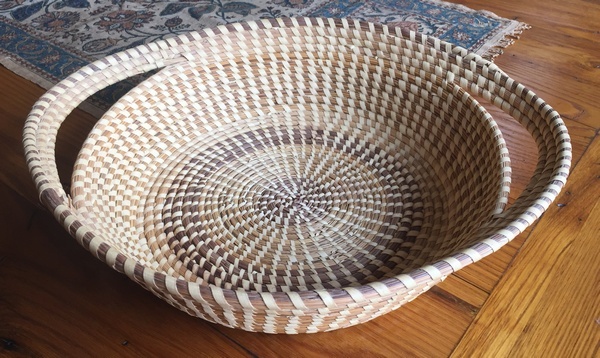 The Gullah baskets of Henrietta Snype. This one I bought from her during a demonstration she was giving on Gullah work. She uses the sweet grass harvested on the coast of South Carolina and it is much coarser than the sweet grasses of the northern United States. 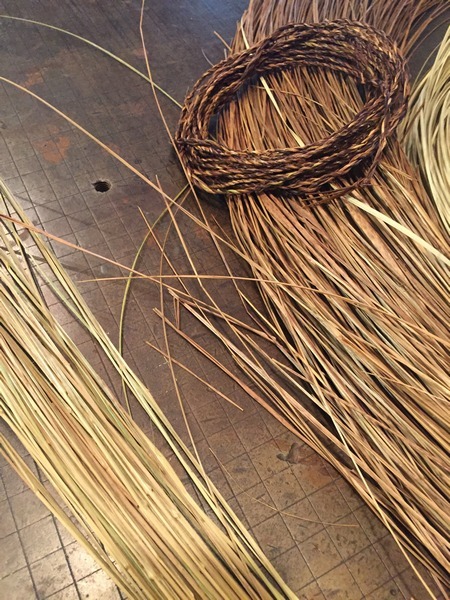 The darker parts here are pine needles for contrast and the palmetto fronds are prepared and sized to be used as the lashing material. She gave me some to try back in 1992 when she was demonstrating and I still have them! 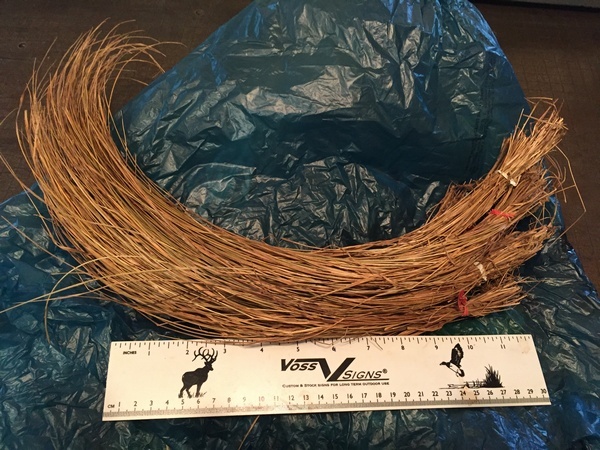 The lighter sweet grass in the picture below is the sweet grass from Maine and was the one I used for the small sewing basket and coiled piece. It is on the left and one and a half times longer and more uniform in shape and size than the grass harvested in Michigan and Washington. 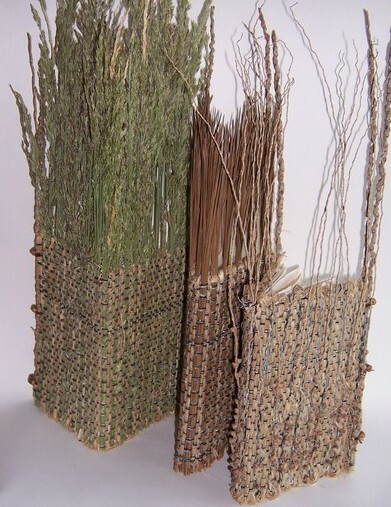 I would also use these grasses in baskets made on the loom. That one in the top picture from an article I wrote was woven using a popular overshot pattern…Johann Speck’s #33 to be exact. 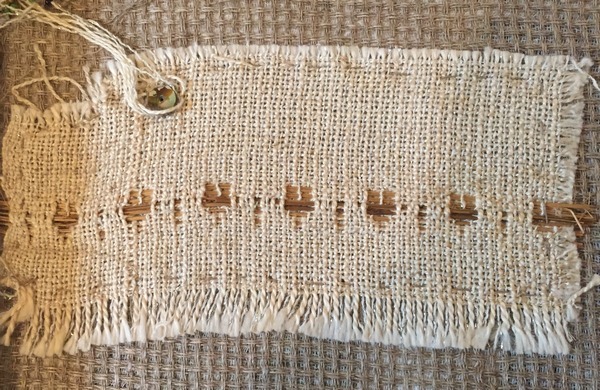 The pattern weft was the sweet grass. The warp was a fine mercerized cotton. The rims were hand peeled ash from log pounding with a tribe native to Michigan. Finished it is 24″ x 16″ x 16″. It smelled wonderful. Here is another small sample of using the grasses on the loom. 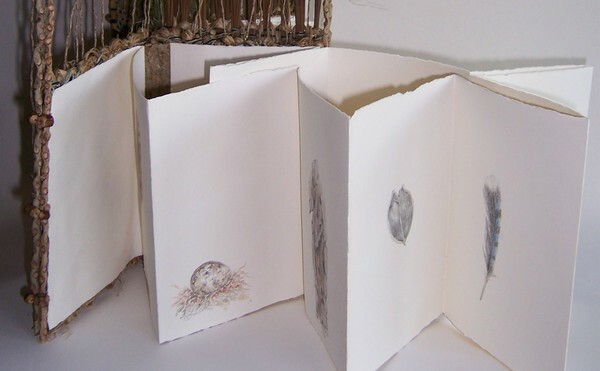 And the last one done about eight years ago going all out making connecting covers for a “Nature Journal”. Collected grasses from here, pine needles saved from the nineties and palm inflorescence. When the sweet grass was dampened the smell was wonderful. My grass and my nose are older. When I finished due to sore thumbs the other day, my fingers looked like I took up rolling my own. The stains are still there. If I could I would pack the whole lot up and take it to basket making friends in Australia. But I can’t. I don’t know many basket makers any more so maybe I am stuck with warping up the loom in the studio and making a very long table runner. It most certainly will not be warped at twenty plus threads to the inch….my eyes have aged at the same rate as my thumbs and nose. Here is how all the hand peeled spints ended up. Sure I used up all the splints and more, but I still have the eight foot boat. I am not sure I have got the hang of downsizing. Maybe a match really is the answer.